More and more, we engage our customers and employees in service development at the early stages of the process, says Aalto Service Leader participant Anna Kurtelius, Customer Experience Manager, S-Bank. Established in 2007, S-Bank develops its services continuously and on many levels: new consumer services are being built and internal efficiency and performance improved. In consumer services, focus is, above all, on digital services that make life easier for the bank's co-op members, says Anna Kurtelius, who works with customer profitability and development at S-Bank. 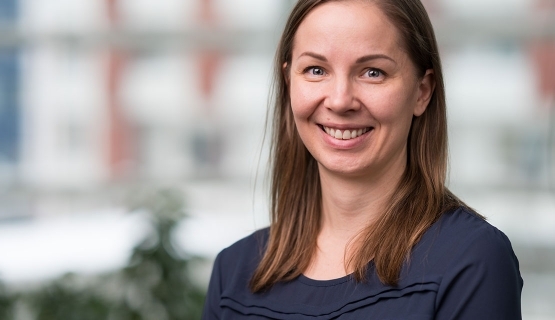 Kurtelius participated in the Aalto Service Leader program to gain new insights and to boost her own work and the entire organization's development. She says the program included a useful selection of topics that are relevant for many companies right now. The participants – mostly business managers – explored the possibilities offered by digitalization, learned how to leverage customer experience to develop new service business models, and gained new tools to manage performance towards transformation. What was particularly useful, says Kurtelius, was how the program bundled and clustered the phenomena currently affecting organizations and their operating environment into frameworks or models that make it easier to study their causal links from different angles. “In your daily work, you see only parts or singular occurrences of these phenomena, and sometimes getting carried away may prevent you from seeing the relationship between the parts and the whole,” Kurtelius says. The wide variety of case examples from different industries and from other countries also helped to broaden one's thinking. The most in-depth aha moments arose from discussions with other participants during the contact sessions. S-Bank has some three million customers and 650 employees. This allows for the bank's organization to adapt nimbly to changing needs, Kurtelius says. The organization's informality also contributed to the work of the Echo Team, which was an essential part of the program. Utilized in many Aalto EE and Aalto PRO programs, the Echo Team's objective is to ensure that the entire organization benefits from the program. Kurtelius was positively surprised by the Echo Team's impact. “At first, putting together the Echo Team and preparing for and facilitating its meetings sounded to me like extra work. But when the work commenced, I had a change of heart,” Kurtelius confesses. She says the Echo Team gave structure to her studies. Kurtelius says it was easy to pick out the topics relevant to S-Bank from the course content and bring them to the Echo Team to discuss. The Echo Team participants represented different units and levels of the organization. A few participants joined the team after the program had already started after hearing about the inspiring discussions. The finance sector is currently going through one of the biggest transformations in its history. The drivers are familiar from other industries: digitalization and changes in customer behavior. From S-Bank's point of view, the impact of digitalization can be felt everywhere. It means new kinds of services, renewing existing services, for example, by digitizing them, new channels, new business models, new technology, robotics, and artificial intelligence. The change is not only about mobile applications or networks, but also about the expectations we have about dealing with the bank personally. " In developing new business models, S-Bank's most important partners include the S Group and the LocalTapiola Group. The ecosystem also includes inter-bank collaboration forums as well as those covering the entire finance sector, and operators such as the financial services corporation Visa. “We are also involved in creating a new digital trading system for the residential real estate market together with other banks and the digital product studio Tomorrow Labs. It's based on blockchain technology,” Kurtelius says. To prepare for changing customer expectations, S-Bank regularly collects market data on consumer needs and behavior. In service development, this is supplemented by qualitative data gathered, for example, through group and customer interviews and usability testing. Data analysis, predictive modelling, and various AI solutions add to the understanding. “Being part of the S Group, which consists of independent cooperatives, we want to be present in our customers' everyday lives. More and more, we engage our customers and employees in service development at the early stages of the process,” Kurtelius says. The banking sector is disrupted by new players who enter the arena in rapid succession. These include both small startups and online giants, such as Google and Amazon. This is a challenge to banks whose traditional role has been to act as the carriers of trust in the society and in bilateral trade. “It will be interesting to see how the situation develops and how quickly consumers begin to trust the new players. Would you transfer your salary account to Google?” Kurtelius asks. Organizational and service development requires curiosity and adaptability also from the personnel. At S-Bank, this is fostered by company culture that promotes innovation, Kurtelius says. Open communication is encouraged and facilitated by concrete tools, such as the Innostamo discussion forum that is open to everyone. Furthermore, space is given for career development, and changing jobs within the company goes smoothly. “The bank is young and we have a lot to do, so we've had a chance to assume responsibility and develop ourselves,” says Kurtelius, who has been working at S-Bank almost from the beginning and has participated not only in the Aalto Service Leader program but also in Aalto PRO's Service Design program. The bank invests in leadership development and has taken a coaching approach to leadership. The goal is to give space, power, and responsibility for everyone to innovate and think for themselves. “We have the benefits of a big corporation and the spirit of a small firm,” Kurtelius says. Aalto Service Leader program helps you to lead your service business to innovation and growth.